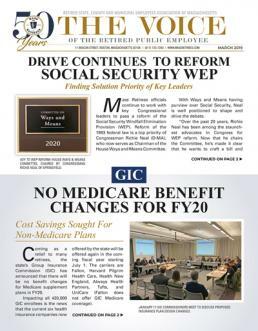 July 2015 Voice: For nearly fifty years our Association has led the fight for cost-of-living benefits for public retirees. During that time several milestones have been reached, whereby COLA benefits have been incrementally increased for retirees. The most significant recent steps were made in 1997 and 2010. In 1997, Mass Retirees overcame significant opposition from the Mass. Municipal Association and Mass. Taxpayers Foundation winning the passage of Chapter 17. This law established the $12,000 base, as well as returned payment of the local COLA to municipalities, counties and authorities. For the next thirteen years the state uniformly determined the COLA base for all retirees at $12,000. Then in 2010, as part of the Chapter 69 Municipal Relief Law, the power to set the COLA base was turned over to local retirement systems, with the approval of their local legislative bodies. To date, 59 local retirement systems have increased the COLA base beyond the $12,000 set by the state back in 1997. The local COLA base now ranges from $12,000 to $18,000. Over the years the greatest obstacle to increasing the COLA base at both the state and local levels has been our retirement systems’ unfunded liability. As one of the last states nationally to begin pension funding in the late 1980s, Massachusetts has come a long way towards having a secure, stable and sustainable public defined benefit system. Beginning in 1988, the retirement law (as well as Wall Street bond rating agencies) has required that COLA benefits be paid for through the pension funding schedules. Therefore, higher COLA bases are determinant on the ability of the retirement system’s pension fund to cover the new costs. As of April 2015, 25 local retirement systems were funded at or above 70%. Another 31 systems are now between 60-69% funded. When updated asset valuations are done in 2015 and early 2016, this number is expected to climb dramatically as systems fully recover from the economic collapse of 2008. Troubling to Association officials is the fact that 8 of the top 25 funded systems have not moved to increase their COLA base beyond the original $12,000 set eighteen years ago in 1997. For instance, as of its latest valuation, the MWRA Retirement System is 98.3% funded, yet its retirees remain at a $12,000 base. Concord and Winchester, 81% and 77.4% funded respectively, also remain at $12,000. Winchester is currently undergoing a valuation, which will likely advance its funded level beyond 80%. And in Leominster, where local retirees have recently organized with the help of our Association, not only does the base remain at $12,000, but retirees have not received any COLA increase in over five years! As we have reported, Leominster is among the best-funded systems in the country with a listed funded level of 79%. However, the system has also opted for one of the most conservative investment return assumptions of any system in the country at just 5.5% – artificially lowering its funding status.